What do we mean by a “good conversation starter”? Good conversation starters engage the other person and illicit a response. They relax those conversing and lead to longer and, perhaps, deeper conversational topics. Take a Deep Breath and Relax. Remember that people talk to each other all the time and most conversations come naturally after the first few sentences. Let Go of Your Fear. Do not worry about being boring or saying something stupid. Just begin talking. Introduce Yourself If Appropriate To Do So. If you think that doing so will help, extend your hand, and tell them your full name and, if they do not tell you theirs, ask what it is. There are a few things to remember when you start a conversation. It is best to build a conversation on something you know the person likes or something you have in common, so choose your conversation topic carefully. Add intimacy by saying the other person’s name occasionally throughout the conversation. Use questions and respond to what your listener says appropriately. Also, consider the time and place. You probably do not want to use a funny conversation starter if you are at a funeral or after a sad movie. Use Current Events. If you know of something that happened recently that most people are talking about, ask the other person what they think about the story. Just be careful not to discuss anything too controversial – a real conversation stopper. Use the Listeners Favorites. If you know something the other person really enjoys, that is always a good conversation starter. We all like to talk about what we love, whether it is a hobby or pastime, a pet, or our family. Talk About Your Favorites. If there is something you really love, your will find it easy to talk about it with someone else. Sometimes your listener may want to just listen to you talk for a while and your enthusiasm about what you love may encourage them to open up and talk. Doing so helps you remember the person’s name and often puts then at ease. It also adds a sense of intimacy, so is a good tool to use when talking about personal subjects. An open-ended question cannot be answered with a simple “Yes” or “No,” but needs an explanation. Using the words who, what, when, where, why, and how cause the person to elaborate about their thoughts, feelings, and opinions. Talk about something that is of interest to you, and then ask a question related to what you said. For example, share the title of your favorite movie, then ask the name of theirs. Words such as “feel,” “appear,” and “hear” encourage your listener to not only pay attention, but also remember the conversation. Describe colors, sounds, tastes, and feelings to paint a visual picture of a place or event. Smile and laugh when someone is funny. Use facial expression to denote gratitude, empathy, and curiosity as appropriate for the conversation’s content. When you start a conversation with a girl, the key is sincerity. Most girls can tell if you are a player, just using flattery to get and keep their attention. Often beginning a conversation talking about you puts a girl at ease and opens the door for sharing thoughts and ideas. Sometimes it is best to practice on a female friend or family member. Your sister, if you have one, will be brutally honest if your conversation starter misses the mark. Mothers and other older female relatives may also be able to give some advice as to what works and what does not. Remember to really look at her. Flattering comments dealing with appearance are always good conversation starters. Do you like her hair or eyes? Tell her. Is she wearing your favorite color? Let her know. Tell me where you are working (this summer, for the holidays, etc.) and why you chose that place. This open-ended question works to start a conversation about siblings, grandparents, and funny family vacations and experiences. Name one thing you own that you really love. 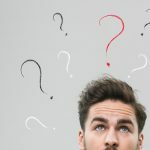 Asking this question and listening carefully to the answer gives you some foundational information upon which to build an interesting conversation. Talk about your most embarrassing moment and ask about hers. Embarrassing moments are usually humorous, so this topic will help her relax and feel comfortable talking to you. Talk about your favorite food (color, song, movie, etc.) and ask about hers. Favorites always work well as conversation starters. Remember to pause while sharing yours so she has a chance to speak. Relay what you have planned for the weekend and asked about her plans. You may find out you have the same or similar plans, which can lead to sharing some time together. Tell her about your pets and ask about hers. Girls love talking about their pets. If she does not have any, ask what animal she would like to have as a pet. Ask what types of clothing she enjoys wearing the most. A good key to finding out her personality type. If she goes for casual clothes, future dates to sporting events, movies, or a local burger joint probably will appeal to her. If she loves to dress up, consider a date to the fancy restaurant. Ask her favorite thing to do with her friends. If she likes to do something with her friends, she will probably enjoy doing it with you as well. Ask what is the best thing that has happened to her lately. Another good way to find out what is important to her – money, helping others, etc. Ask her opinion about where you are, what you are eating, or what you are doing. Girls like to be taken seriously and when you ask your opinion, she gets the idea that you have respect for what she thinks. Ask which she prefers – texting, calling, or emailing. You can follow up by asking for your new friend’s phone number or email address. The key to starting a conversation with a guy is knowing his interests. Check out his Facebook page, if he has one, to see if he likes cars, fishing, sports, etc. Usually a leading question about his favorite pastime will get the conversation going. If you do not know some of the terminology he uses, ask him to explain. Additionally, a sarcastic or funny comment can get the conversation going. Practice starting a conversation with your father, brother, other male relative, or a male friend. Since you are practicing with someone you know, you can relax. Make sure you ask them how well you are doing at starting a conversation and for any tips they may have. Most guys love cars, so ask him about his first car. Continue the conversation by asking about his dream car. Ask if he has any pictures of vehicles he likes or vehicle shows he has seen. Guys get scars from being so active. Ask him if he has at least one scar from some activity or mishap. Ask he responds positively, ask if you can see it (if it is not someplace inappropriate), and what the story is behind the scar. Guys like compliments and do not receive them often. If you like his shirt, tell him so and why – it is your favorite color, you like the style, etc. you can also comment on his hair. If he has none, ask if he would like to have a tattoo. If he responds positively, ask of what. Ask about the scariest thing he has ever done. Guys tend to be daredevils. Asking this question is a good way to get him to talk about his daring deeds. Ask if he participates in or enjoys a particular sport. It should not be hard to get him talking about a recent game or his favorite player. Make an animal noise and then explain that if you could be any animal, this is the one you would choose and why. Then ask the other person which animal they would choose to be and why. Tell about the silliest, weirdest, or wildest thing you have ever done and ask your listener to tell about their experiences. Tell a joke you have heard recently and ask your listener if they have heard a good joke lately. Tell about a weird or yucky food you have eaten lately and ask what they have eaten that was unusual. Ask about what they do when the power goes out and tell about what you or your family does. Tell which superhero you would like to be or super power you would like to have and ask which they would choose. If you have a nickname, tell the story behind it. Then ask them if they have a nickname and how they got it. Tell about one thing that happened to you this week that made you laugh and ask them what made them laugh recently. Share a fun story about your family and ask about your listener’s family. Share who is your favorite cartoon character and why they are your favorite. Then ask them to share theirs. Ask what their favorite comedy (movie or sitcom) is and what part (or episode) they thought was the funniest. Share yours. Find out if the other person dreams in color and hears sounds when they dream. Share your most embarrassing moments. Talk about the dumbest purchases you have ever made. Share the worst movies you have ever seen. Discuss pet peeves and habits that are annoying. Talk about collections – stamps, rocks, etc. Share the most adventurous things you have ever done. Share you best vacations and worst vacations. I you knew you were going to die tomorrow, what is one thing you would want to do? If you could be one age for the rest of your life, what age would you choose to be? What is one thing hard for you to do? What is one thing you hate about yourself? What is one thing you have never done that you would love to do? What is one thing you like about your Mom? What is the best live performance you have been to? What is your favorite food? Your favorite drink? What is your favorite thing on which to spend money? What sporting event, concert, or other form of entertainment would you buy tickets to regardless of how expensive they were? Who (is) was your favorite teacher in school? Who is your favorite singer? Your favorite actor (actress)? Whom do you consider the most important person in your life? Would you rather take a vacation in the mountains or at the beach? Do you have any nervous habits? How many siblings do you have, and what are their ages? If you could be an animal, what animal would you be? Wny? If you could live at any time in history, what time period would you choose? Why? If you had to eat the same food every day for the rest of your life, which food would you choose? Why? What possession do you cherish the most? What song would you choose as your theme song? What sound do you like best? What sound do you hate? What was the most recent movie you saw? Did you like it? Where have you lived? For how long? How old were you when you lived in each place? Once you get a conversation started, the next thing is to keep it going. Doing so helps you find out more about the other person and begin building a relationship. 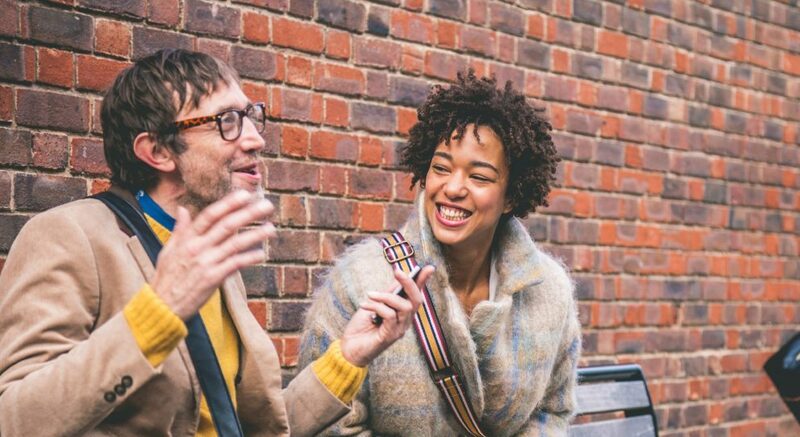 Our four tips will help you keep the conversation rolling. Cues that the other person wants you to talk, such as a series of questions directed at you. Pauses that indicate a change in topic. Signs that the other person is getting bored with the conversation and that it needs to change direction, such as yawning or losing eye contact. 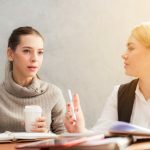 Pay attention to what the other person is saying, so that the conversation moves smoothly and you are aware when a response or comment is appropriate. You may be able to use what you hear to ask additional questions or make comment to keep the other person talking. Acknowledging what is being said with single words, such as “Oh,” “Wow!” or a nod or shake of the head helps move the conversation along. Think about any previous conversation you may have had with or about the person. For example, if you had a brief conversation previously about a school project, ask for more details. If you know the person’s favorite movie or song, discuss the acting or the singer and their most recent album. Most girls like to share their feelings – about clothes, their friends, and their families. Finding a topic that is of interest to a girl can get her started talking and keep the conversation going. Ask a girl about her pets or animals in general. Then share information about your pets. Liking animals and talking about them is a great way to keep a conversation going. Remember to be sensitive to feelings. Make sure the girl you are talking to is comfortable with the topic you have chosen. Be thoughtful and stay away from topics that may be too personal, such as previous relationships or the death of a family member. If necessary, talk about simple things. Simple, everyday topics, such as the weather, are non-threatening and can lead into longer conversations. For example, talking about the weather (“It sure is hot today.”) can lead to a longer conversation about ways to stay cool (“But it is great weather for swimming. Do you swim often?”) Simple subjects keep a conversation relaxed and usually avoid controversy, making it possible to find things you both like. Stay away from deep or controversial topics until you know each other better. Choose the right questions. Avoid anything romantic, very personal, or sexual in nature, as you do not want to scare her away. Use our list of Conversation Starter Questions or Funny Conversation Starters to get her to relax and talk about herself. When she seems to be talking about a subject of particular interest to her, use questions to keep the conversation going. Avoid questions that can be answered with just a “Yes” or “No” as much as possible unless you can follow her answer with a “Why,” “Why Not,” “How,” or another suitable query. 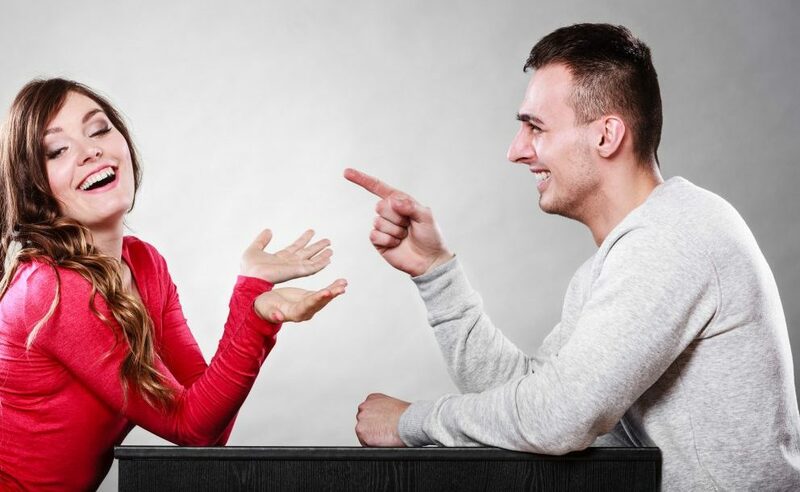 Although it sometimes is difficult to start a conversation with a guy – especially with one you have an interest in – it can be even more difficult to keep the conversation going. Consider making a comment on where you are or what you are doing. For example, comment on the room, the food, or the lighting and ask him what she thinks about each. Any topic that leads to a string of questions and answers will keep the conversation moving. However, if you follow these tips, you will achieve success. Use questions to get him to open up and talk about himself. After all, the goal is to get to know him, and if you talk only about yourself, you will end up knowing nothing about him and appear self-absorbed. Watch for clues that he is talking about something that really interests him and continue asking questions or making comments to keep him talking. If you agree with him, say so. If you do not understand something he says, ask him to explain. Use facial expressions and phrases to indicate you are paying attention and to encourage him to keep talking. Do not interrupt with long comments of your own unless there is a pause. Let your facial expression convey your reaction to what he is saying. If he says something funny, laugh. Men do not get compliments often. Think about it; men do not compliment men. Therefore, a simple mention of liking something he is wearing, participates in, or his hobby goes a long way. Just do not go overboard with compliments, as that becomes creepy! Although it is not always easy to start a conversation and keep it going, the more you converse with others, the easier it will become. Soon you will find beginning a conversation with someone comes naturally and without much effort. 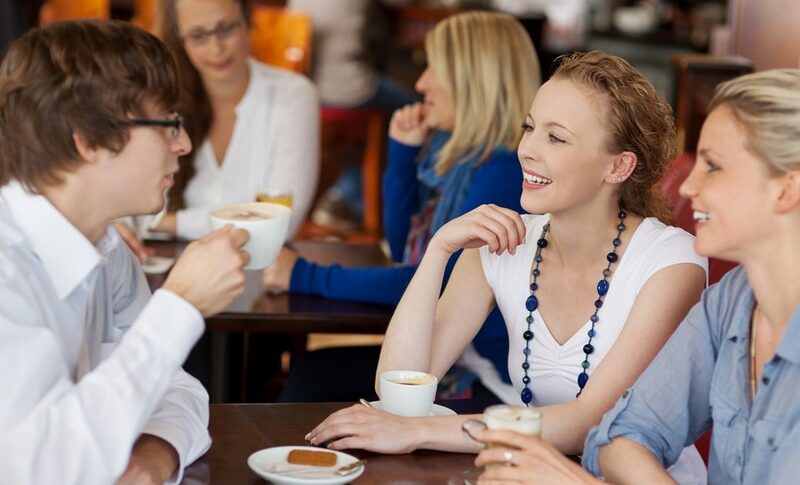 Once you learn how to start and keep a conversation going, you will make more friends and have more opportunities for socializing. 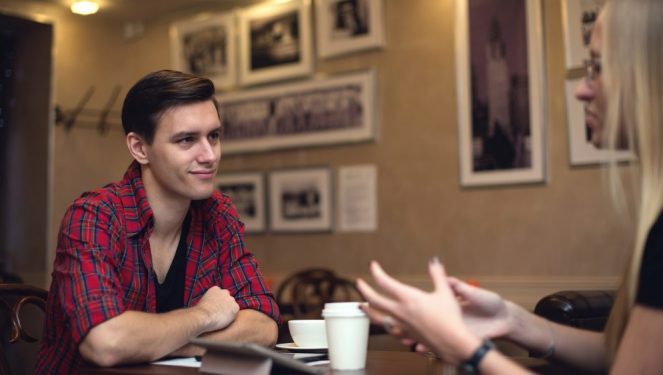 Get out there and meet people, using what you have learned in this article to be a great conversationalist!